Do you remember the 1970’s? ORANGE, BROWN, and GREEN ohhhhhh myyyy! When we first purchased our home, the 70’s were alive and well!!! You can see some before pics here. **Warning-The images are disturbing! Since this was not our personal style, we decided to remodel this baby! No problem, right? 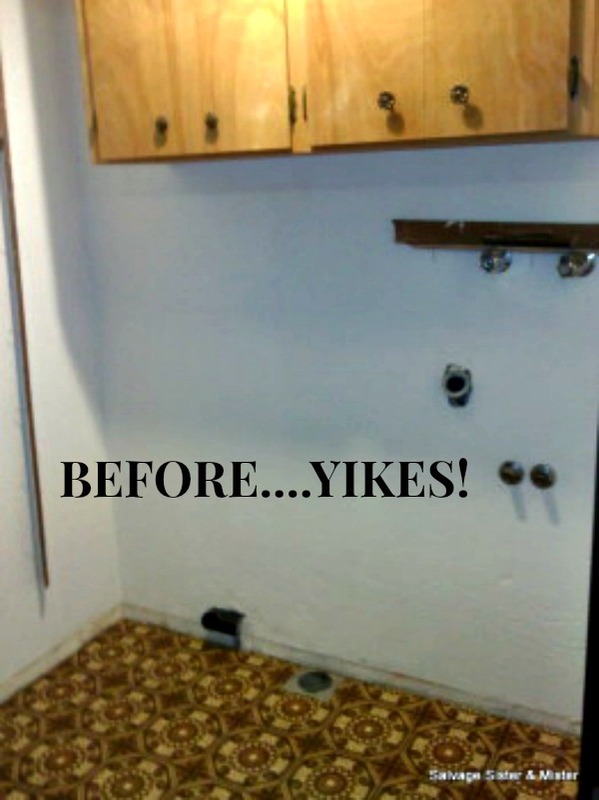 Home remodels are a piece of cake…………said no one ever! Updating a home is no small task. It takes plenty of time and finances. Since we are short in the finances area, it can seem to move at a snails pace. We are taking ours inch by inch – LITERALLY! 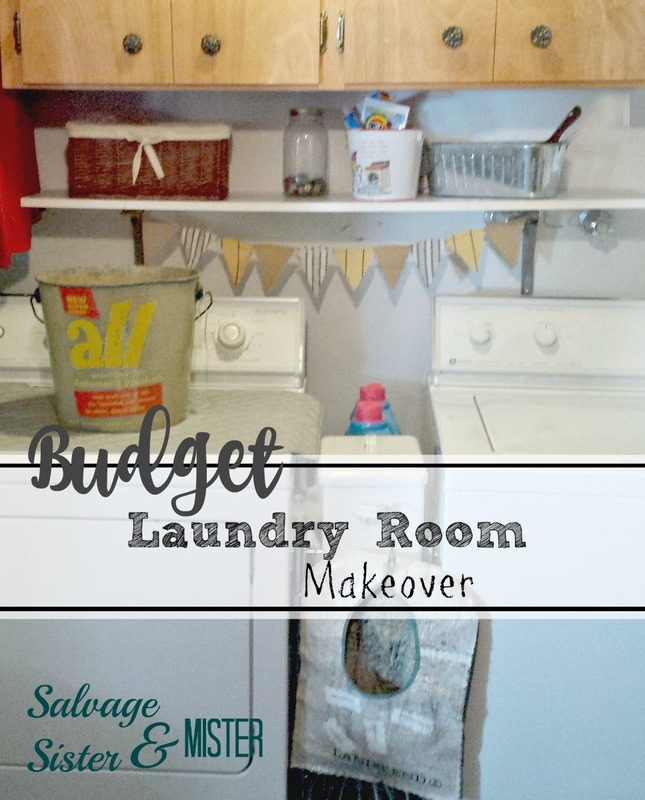 Including this budget laundry room makeover………. Nice floor, huh? That was the first to go…and for $4 too…YEP! The next thing we, as in the Mister, did was install a shelf below the cabinet. I added a simple scrap banner to try and hide some scuffs and the brackets. I may make a slightly bigger one but for now, that’s what I had to work with. The laundry cart between the washer and dryer works so well. We have this one, but here is THIS and THIS as well found on our Amazon Partner. Now, where to hang the clothes? 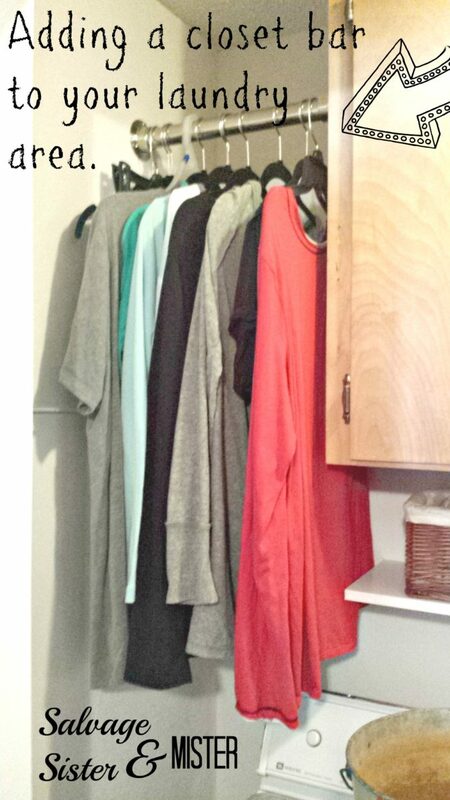 In our previous home, we had a wonderful long bar to hang clothes on since I am anti-iron (I don’t even own one). In this house, there is no space for a full bar but one off of the cabinet would work. We purchased a closet bar/pole and brackets from our local hardware store, but found equivalent ones with our partner, Amazon…BRACKETS and POLE. A hacksaw or grinder can be used to adjust the pole to the size needed. *Remember when cutting the pole, to cut just a hair shorter than the length you need to account for the bracket. Next up in this budget laundry room makeover? The cabinets will be painted!!!!!!!! All on a dime budget. *We don’t always get to make the changes we want, but we do the best with what we can do!! 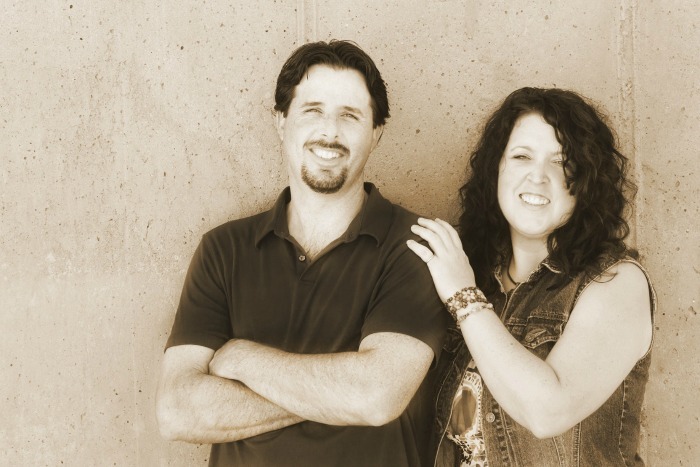 Any remodeling projects you are taking on right now?